The DA plans to approach the International Criminal Court (ICC) if President Cyril Ramaphosa fails to intervene directly to stop the "ongoing human rights violations" on Zimbabweans, allegedly by president Emmerson Mnangagwa's government. "If Rampaphosa fails to intervene and advise Mnangagwa to stop the military clampdown on civilians, the DA will be left with no option but to approach the ICC to consider a preliminary investigation into these violations as outlined in the Rome Statute," said Stevens Mokgalapa, the party's spokesperson on International Relations and Co-operation. "The ICC's Office of the Prosecutor is empowered by the Rome Statute to '... determine whether there is sufficient evidence of crimes of sufficient gravity falling within the ICC's jurisdiction, whether there are genuine national proceedings, and whether opening an investigation would serve the interests of justice and of the victims'." Mokgalapa said the DA strongly believed that the human rights crisis currently existing in Zimbabwe was of sufficient gravity to warrant an ICC investigation "because, according to the Zimbabwe Human Rights NGO Forum, at least 12 people have been killed, 78 shot at and 240 faced 'assault, torture, inhumane and degrading treatment'." There has been a violent crackdown on protests that began last Monday in Zimbabwe after the government more than doubled fuel prices. The DA claimed Ramaphosa and his government "seemed intent on sitting on their hands over the Zimbabwe crisis in much the same manner as (former president) Thabo Mbeki's failed diplomacy". "In 2008, people were attacked and murdered with impunity in another state sanctioned military clampdown targeting innocent civilians after a disputed election. Mbeki's silence only served to worsen the human rights climate in Zimbabwe and led to a collapse of the economy, whose consequences are still being felt to this day with thousands of Zimbabweans flocking to South Africa to seek economic refugee," he said. Mokgalapa said the DA would not stand by while Ramaphosa repeated a "Quiet Diplomacy 2.0" strategy that was sure to produce the same results as "Mbeki's ill-thought foreign policy". "Minister Lindiwe Sisulu's claim that the internet shutdown in Zimbabwe, which was implemented by their government after protests broke out over fuel increase early this week, was an internal matter, fails to appreciate that the blackout was used as a cover to unleash the military in residential areas to beat, torture and kill innocent civilians," he said. He said like the ANC, the ZANU-PF government was quite simply the same bus filled with empty promises being driven by a different driver who has no power to steer the party in the right direction. "The very same people who terrorised Zimbabwe under Robert Mugabe are still in charge under Mnangagwa. The people of Zimbabwe were promised a new dawn when Mugabe was ousted, much like South Africa when Jacob Zuma stepped down. Both have proven to be myths," said Mokgalapa. He claimed that the era of comradeship between Ramaphosa's ANC government and Mnangagwa's ZANU-PF government, while human rights were being trampled on with impunity, was over. "President Rampahosa is faced with an easy choice, either he intervenes to stop civilian abuse by the military in Zimbabwe or his government will be one of the parties that will answer to the ICC on why they failed to act to stop the human rights violations. Ndivhuwo Mabaya, spokesperson for the Department of International Relations and Cooperation, said minister Sisulu had received a briefing on Sunday morning on the developments in Zimbabwe. "On the Zimbabwe protests and efforts to address economic challenges, the Minister has noted that protests in Zimbabwe have calmed down and life in the streets of Zimbabwe is returning to normal," Mabaya said in a statement. Sisulu also received a briefing from the South African ambassador to Zimbabwe Mphakama Mbethe on the economic situation in the country, according to Mabaya. "Minister Sisulu indicated that the South African government was working with the Zimbabwean government in finding a short and long-term solution to the economic situation. The Minister added that if the situation is not attended to, the current economic challenges can derail the political and economic progress the country has made since the election of the new president," said Mabaya. 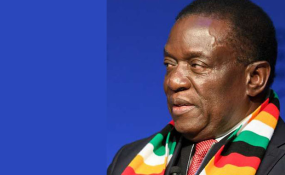 Mnangagwa tweeted on Sunday: "In light of the economic situation, I will be returning home after a highly productive week of bilateral trade and investment meetings. We will be ably represented in Davos by Minister of Finance, Mthuli Ncube. The first priority is to get Zimbabwe calm, stable and working again."